Fabric manager component must always be at the top of the hierarchy. Its main responsibility is to manage the component hierarchy. A scene MUST have only ONE Fabric manager present. 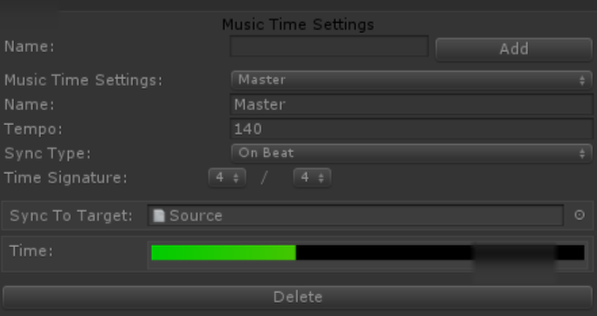 Fabric allows to create global music timing settings that a number of components can sync with. The manager also provides a pool of audio sources that are used by the audio components instead of having to create one for each instance. For example if there is an audio component that has a very big number Fabric’s default behaviour is to create an audio source for each instance. However, using the audio pool the number of audio sources is pre-allocated. NOTE: At the moment if the maximum number of audio sources are used the pool will fail to allocate a new one. Usage value shows the number of audio sources that are in use. The info section shows the number of game objects uses by the fabric hierarchy as well as the memory used by the manager (NOTE: it does NOT include the audio memory used, for that you need to look in the Unity profiler) and CPU usage of the node (inclusive). - Virtualization: If a component is playing and its volume drops below the threshold (through RTP or game input) then the component will turn virtual until its volume threshold is higher again. In order to reduce memory usage and performance it is possible to set the maximum number of virtual events that will be used by all components. Enable audio component to turn virtual (i.e. not playing) when listener is outside its max distance. Enables the automatic importing of timeline (*.fdp) projects located in the resources folder. It is possible to manually import an ftp project. Allows group components outside of the main Fabric manager hierarchy to be automatically register. This will create all the component instances in the editor according to their max instances value. It’s aimed to reduce load times at runtime. NOTE: To make the instances visible you need to have the “Show All Instances” option enabled. Locks the position of an axis into the value set (0 will be ignored). This option allows for all property changes that occurred during editor play mode to persist even after the editor has stopped playing. This is ideal for live tweaking and balancing the mix of the game. 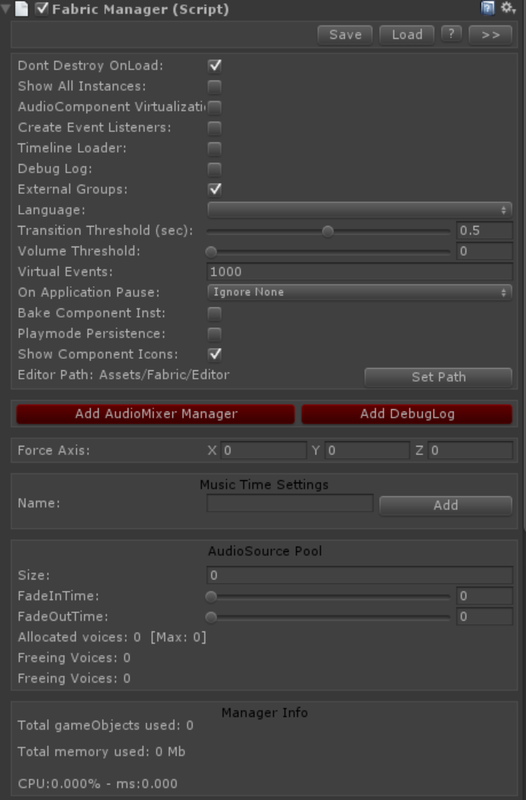 The Add/Remove AudioMixer Manager button will add or remove the audio mixer component that is necessary for Fabric to communicate with Unity's audio mixer.